Breast thermography offers women an early warning system, enabling them to be proactive with their breast health. Breast thermography - a painless, radiation-free procedure - has become an essential tool to any woman’s health care, as it may provide the earliest possible sign of the development of breast cancer. It assists in early detection and monitoring of abnormal physiology and the establishment of risk factors for thedevelopment or existence of cancer. Thermal breast scans have proven to detect the first signs of cancers up to ten years before other procedures. 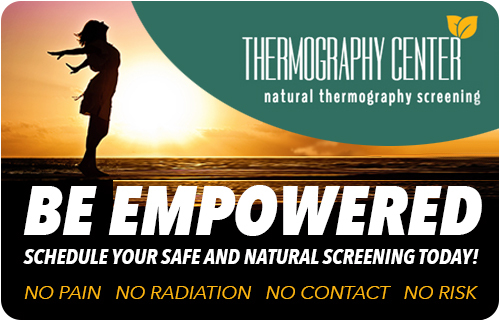 Thermography empowers women by giving time to make decisions, along with their health practitioners, at the earliest possible moment. Early detection is key. With the test findings, we can assist women in taking a proactive approach to their health through nutrition, hormone balancing and detoxification and effective behavior changes.